Little Rock AFB - No info. Location: Jacksonville, Arkansas, 17 miles north of Little Rock. Little Rock Air Force Base, Arkansas is located next to the city of Jacksonville in central Arkansas, 17 miles north of Little Rock. From Interstate 30 or 40, take U.S. Highway 67/167, exit 155, to the air base. When you reach Jacksonville, take the air base exit 10 to reach the main gate. If you fly, you will arrive at the Little Rock Airport. There is no military or civilian bus service to the base from the airport or the bus or train stations in Little Rock. On 9 September 1952, the Air Force announced its decision to build a $31 million medium jet bomber base near Jacksonville Arkansas (about 25 miles northeast of Little Rock); construction began on 8 December 1953. By August 1954, the 384th Bombardment Wing (BMW) and 70th Reconnaissance Wing had been selected by SAC to reside at the base. As the two wings awaited movement orders, Col. Joseph A. Thomas (the first base commander) worked with various levels of government on construction of the base. Tragically, Colonel Thomas died in the crash of the base's only aircraft, a C-54 that had been assigned for administrative flying. Finally, on 10 September 1955, the base opened to air traffic. Kc-135s replaced KC-97 tankers in 1964. The B-58 bomber arrived from Carswell AFB in August 1964, and were phased out in 1969-1970. The Corps of Engineers, Little Rock District, conducted site selection. Silos for the 373rd SMS were located at Mount Vernon, Rosebud, Heber Springs, Albion, Center Hill, Antioch, Velvet Ridge, Judsonia, and Hamlet. Silos for the 374th SMS were located at Mount Vernon, Blackwell, Plummerville, St. Vincent, Springfield (2>, Republican, Southside, Guy, and Quitman. 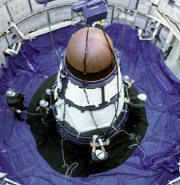 The Corps of Engineers Ballistic Missile Construction Office (CEBMCO) based in Los Angeles managed the overall construction. As with Titan II sites at Davis-Monthan and McConnell AFBs, CEBMCO implemented a three-phase process in an attempt to stem the problems associated with �concurrency.� Phase I at each site lasted approximately 8 months and included excavation and much of the reinforced concrete construction. Four companies based in Conway, Arkansas, won the bid to construct Phase I of the $80 million construction program. Groundbreaking at the first excavation site was held on January 9, 1961. In excavating the silos, the contractors under Army Corps of Engineer supervision, pioneered a new technique of perforating the silo�s circumference to the full depth before charge hole drilling and shooting. Phase II construction lasted approximately 39 weeks at each site and involved installing the mechanical, electrical, water, and other support systems needed to bring the silo to life. During Phases I and II, there were 13 work stoppages having minimal impact on delaying the project. Four workers died on separate occasions due to work-related accidents. Phase III involved the actual readying of the silos for activation. After arriving from the Martin-Marietta facility outside of Denver, the first Titan II ICBM was installed at launch site 373-4 located in White County near Albion on February 28, 1963. For the next 2 months, the Site Activation Task Force prepared this site and the other silos for activation. Starting with the 373-4 launcher on May 16, 1963, Titan II silos entered alert status for the 308th SMW until December 31 when all 18 silos were declared on alert status. With Titan 11s at Davis-Monthan AFB, Arizona, and McConnell AFB, Kansas, already on alert, Titan II activations around Little Rock completed the Titan II deployment program. The Air Force officially transferred Little Rock AFB from SAC to the Tactical Air Command (TAC) on 1 April 1970. On 4 March 1970, the first C-130 arrived on base and began tactical airlift operations and training. On 31 May 1971, the 314th Tactical Airlift Wing (TAW) transferred to Little Rock AFB. Another major change occurred on base in December 1974, when the Air Force reassigned the 314th TAW from TAC to the Military Airlift Command (MAC). Thus, since its opening in 1955, the base has operated under four major commands - SAC, TAC, MAC and ACC. Launch complex 374-7 became the first Titan II silo to be deactivated. In October 1981, President Reagan announced that all Titan II sites would be deactivated by October 1, 1987, as part of a strategic modernization program. The deactivation of the rest of the 308th SMW silos began on April 24,1985. The wing completed deactivation on August 18, 1987. After inactivation, the Air Force removed reusable equipment and the contractor extracted metals and other salvageable components. The silos were then destroyed with explosives and filled in. An outdoor display was set up at Little Rock AFB to exhibit a reentry vehicle from a Titan II and explain the history of the 308th SMW. The base and its mission remained primarily unchanged until August 1987, when the 308th SMW was inactivated. The 314th TAW remained the host unit, supporting global airlift and providing primary C-130 training for U.S. aircrews as well as crews from friendly foreign nations. In June 1992, the 314th AW was aligned under the newly formed Air Mobility Command, the successor to MAC. Then again in October 1993, the 314th AW transferred to Air Combat Command (ACC). On April 1, 1997, the 314th AW transferred to the Air Education and Training Command (AETC). The host unit at Little Rock AFB is the 314th Airlift Wing. The 314th AW is responsible for airlifting supplies and people throughout the world and provides a major part of the "Global Power" leg of the Air Force's promise: Global Reach - Global Power for America. With a dual mission, worldwide aerial delivery and C-130 aircrew training, the wing organizes, equips and trains combat-ready airlift units to operate anywhere in the world. It is responsible for all C-130 training for the Department of Defense, the Coast Guard and many allied nations.